This prayer station helps us to identify our daily habits and tendencies. Then we are asked to reflect on what God’s priorities dictate. Cover the table with the red table cloth and set it like a dinner table set for six. Place the center piece in the middle of the table and the candles on both sides. Arrange the chairs at each place setting. 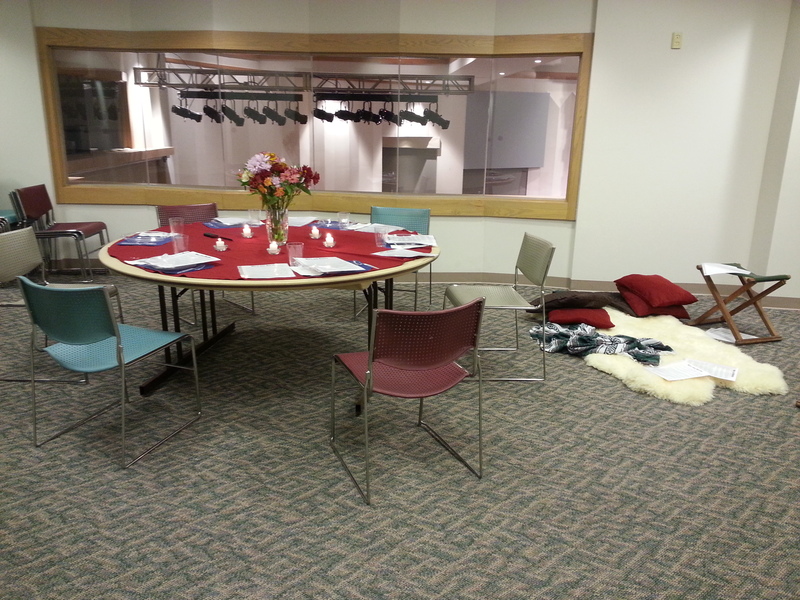 Near the table, use the rug, pillows, and stools to make a primitive seating/gathering area. Place instruction sheets into page protectors and place a reminder label at the bottom right of the page protector. Place instructions around the table and seating area. Jesus and His disciples arrive at the home of Lazarus, Mary and Martha around meal time. The Gospels records that Jesus felt comfortable in their home; the four weren’t just acquaintances but close friends. Naturally Martha invited them in. The story that ensues depicts two very different women with different priorities, different perspectives, but the same love for their guest and friend. As her guests make themselves comfortable, Martha busies herself with preparing the meal. Martha’s words and actions depict her as practical, efficient, and an excellent hostess. Nothing is wrong with being attentive to the details and intent on meeting the needs of others. Or is there? “She had a sister called Mary, who sat at the Lord’s feet listening to what he said.” If you were to stop at this point in the story you might think that Mary was a bit lazy, neglectful, or unconcerned that they had guests in their home. She simply sat at the feet of Jesus listening to him talk while Martha was left to do all the work. Imagine yourself in this situation. You have an unexpected guest who stops in to see you and it is meal time. What role do you generally fill in this story? Are you Mary relaxing and relishing the precious time with your guest? Or are you Martha busy making sure that everything is prepared and perfect? If you are a Martha, go stand by the dinner table as if making preparations for the meal. If you are a Mary, take a seat in the living space around the rug and imagine listening to Jesus. Jesus responds tenderly “Martha, Martha, you are worried and upset about many things.” Martha was fretting over something important to her: being a good hostess. But how important was this compared with other priorities? Who was more concerned about serving her Savior, Mary or Martha? Is one sister right and the other sister wrong? Mary chose listening to Jesus over preparation of the meal. If you are more like Martha this may sound like the wrong decision. Mary knew that Jesus’ words were the most important needs of her life. Jesus reminded Martha that her life was taken up with many secondary needs, but her greatest need was that which Mary acknowledged: the words of eternal life. He commended Mary for choosing what was needed: holy words, truth and precious time with her Savior. Things which can never be taken from her, things that last. In this world full of distraction, filled with frivolous trappings and empty momentary pleasures, help me to keep focused on “what is needed.” Create a balance in my life; a balance between serving and taking time to be with Jesus. When I am faced with the decision of being a Martha or being a Mary, remind me that there is a time for each as long as I am centered on You.